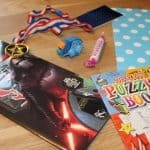 One of the key ingredients to a great children’s party is the party bags. 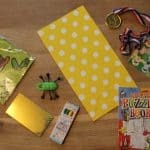 Read on for information about the party bags that we had for my children’s most recent party, plus top tips for your own goodie bags. 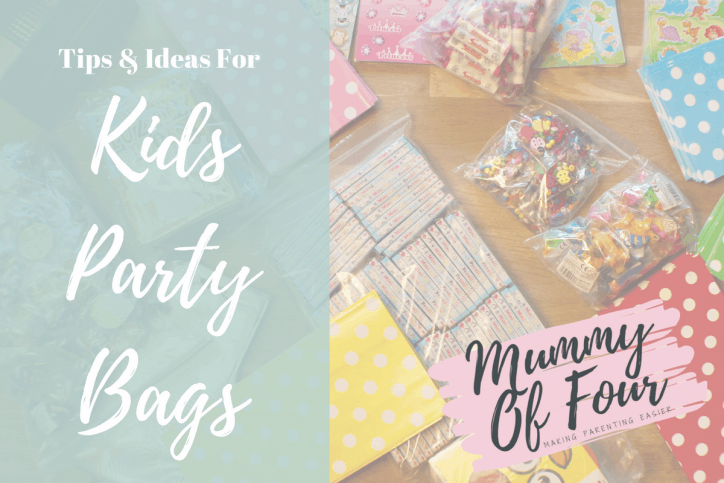 Don’t forget to download my FREE Children’s Party Essential Checklist at the bottom of this post, to ensure that you don’t leave the house without everything that you need to make your child’s party a huge success. 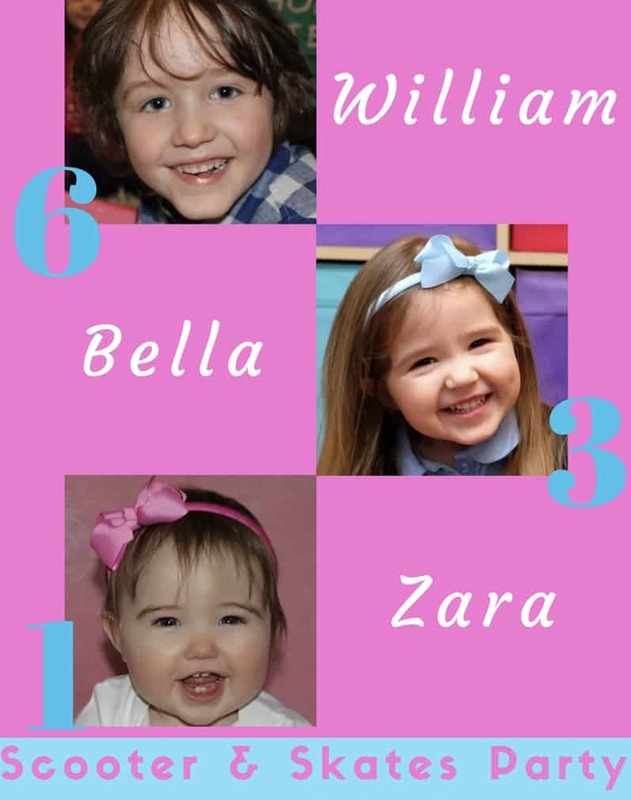 As many of you know, 3 out of my 4 children have birthdays within 5 weeks of each other. 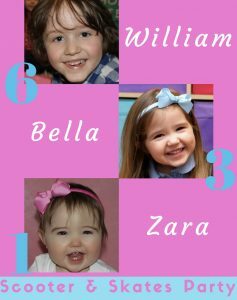 This year, I decided to throw one huge birthday party for the 3 of them, who were turning 6, 3 and 1. In theory, this was going to make life a lot easier, with just one event to plan. In practice, it meant coordinating RSVPs for loads of children, choosing a venue and theme to suit various age ranges, and supplying loads of party bags for children of different ages and interests. Oh great. I began to wonder if I had got myself in over my head. We chose a “scooter and skate” party in a local sports centre. It was a cost effective option, with a nominal cost to cover the rental of the hall, plus the rental of some skates. Children were invited to bring their own scooters too. It was an idea that my nearly 6 and 3 year old were quite excited about. 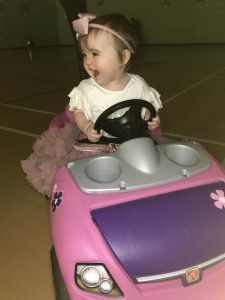 It probably wasn’t going to be the first choice on party for my 1 year old, but the plan was to push her around in her toy car to give her a chance to join in. Once the invites went out, it was time to organise the party bags. 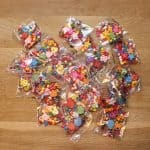 I found a great website called Little Party Parcels* that stock hundreds of different options for party bags and party bag fillers. I liked that they sold their goodies in quantities that the customer can select themselves. So many companies that I had looked at only sold things in set pack of sizes, which could lead to waste or unnecessary overspending to cater for the correct amount of children. 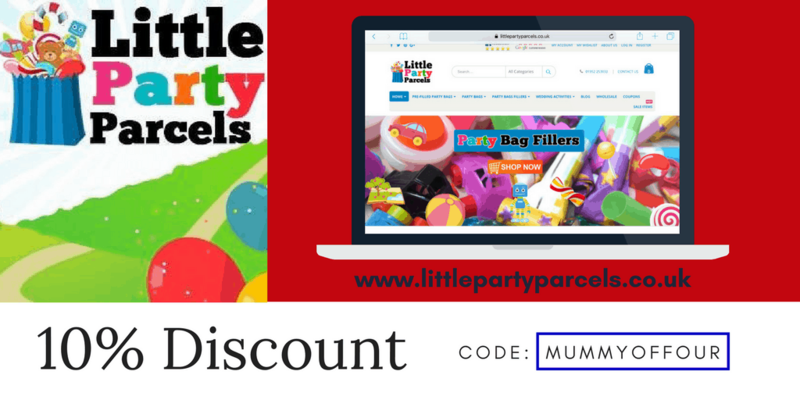 I spoke to Jennifer at Little Party Parcels before we got started, who was so helpful and gave me lots of great tips and advice (take a look at the bottom of this post for some of her fab tips). 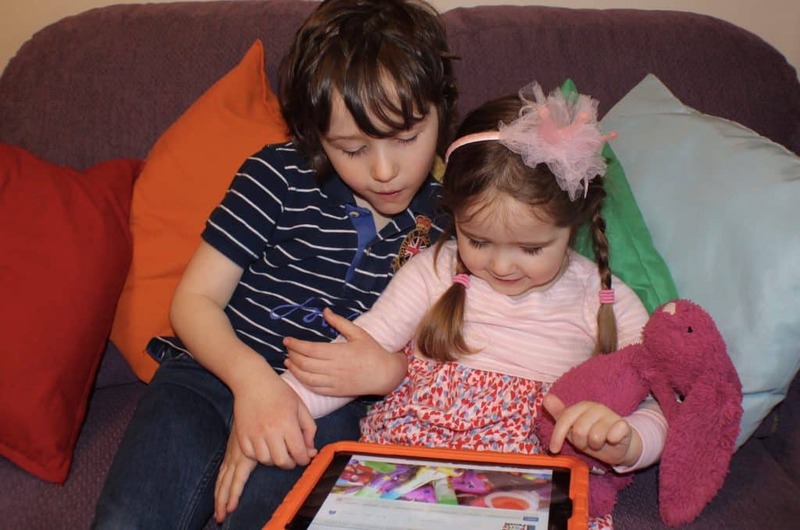 Bella and William had a great time looking through the website with me and selecting all of the bits that they wanted in their party bags. The website was easy to use and they wanted absolutely everything on it. 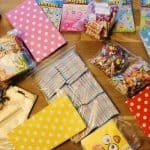 Still, we managed to narrow the order down to enough items for 6 in each of the 60 bags that we needed to prepare. The parcel full of goodies arrived and the children could not have been more excited. As we had decided to cater for children of different ages, gender and interests, there were different toys and treats that needed to be sorted into the various bags. 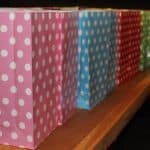 We chose some lovely spotty paper bags in 5 different colours, with different types of gifts in each coloured bag, for easy categorisation without having to directly name each bag. Although Little Party Parcels do offer “pre done” party bag kits, we went for the “bespoke” option and chose our own bags and contents separately. 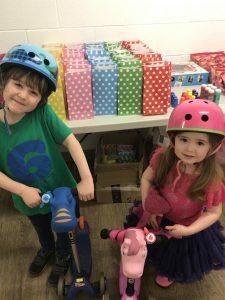 The children loved being able to select exactly what they wanted for the bags, plus it gave us the chances to cater for different chidren’s tastes and preferences. 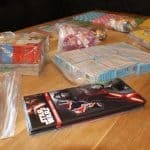 It is worth remembering, that even if you choose a “pre done” party bag option, the bags do not come “assembled”. By the time that boxes of pre done party bags had been thrown about by couriers, they would look quite worse for wear. For this reason, the items come packed separately and the bags can be filled at home. 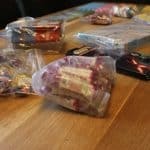 Make sure that you leave enough time to sort the goodies into the bags before the party, the day or so before is ideal. 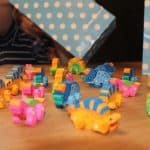 As it happened, my army of excited children were thrilled to help me out with this task, it was a nice way to channel their excitement as the party approached. 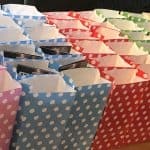 We transported the 60 party bags, plus the drinks and crisps that we were supplying as refreshments, in cardboard boxes. It is worth hanging on to any boxes that you receive with your deliveries prior to your child’s party for this purpose. We arrived around 30 minutes before the rest of the guests to lay out the crisps, drinks, cake and party bags. The children were so excited. The party was a huge hit. William, Bella & their class mates scooted around the sports hall to loud music and disco lights. Zara, being a little young for a scooter, was pushed around in her pink car from Step 2*, which she enjoyed immensely. As parties go, it was a reasonably low stress option. As seems to be the trend at the moment, we didn’t put on a full spread of food, supplying just crisps and drinks instead. The feedback from the party was great. 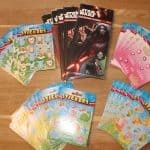 The children had a mad, wild and very fun hour and then went home happily with their party bags. I had numerous messages afterwards thanking me for the lovely party and saying how amazing the party bags were. One little boy was so please with his party bag, that he told his Mum, “Wow, William’s Mum really knows what I like”. I also had lots of reports that all of the party attendees slept very well that night. I am pleased to report, that this was the case for my children too. Colour code party bags to identify different guests and contents, To differentiate any gifts or special dietary requirements within a colour group, fold or seal the party bag in a different way and keep those to the rear of the party bags. 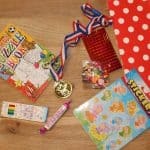 Most party bag gifts are suitable for children over three years as they tend to be quite small. If your guests are younger bubbles and early weaning snacks, such as raisins, dried fruit snacks and vegetable “puffs” or rice cakes are popular gifts which do not tend to upset parents and do not cost too much. 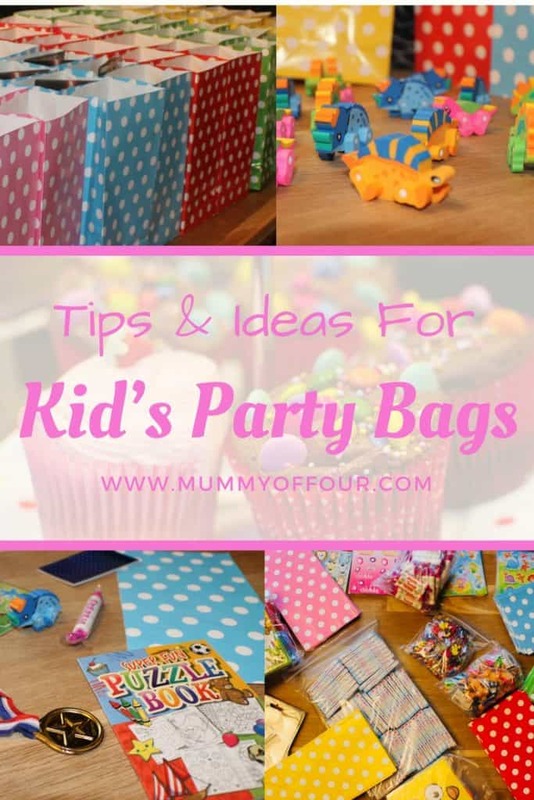 For mixed age-range parties consider if you are going to provide a unisex party bag or a separate one for girls and boys. Then separate the children into age groups, a 2 year span usually covers common interest age ranges. If you are uncertain what to buy consider your child’s interests and things they like, this is usually a good indicator for other children. Party bag gifts are usually the perfect size for handbags and small bags so excess gifts can be used as entertainment for when you are out and about/ advent calendar gifts/local charity shops/school fetes or Christmas charity shoe boxes. Parcels are thrown around by the delivery companies. 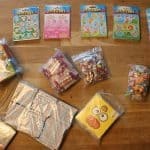 So, the pre-filled party bags and party fillers are sent out to with similar items packed together. 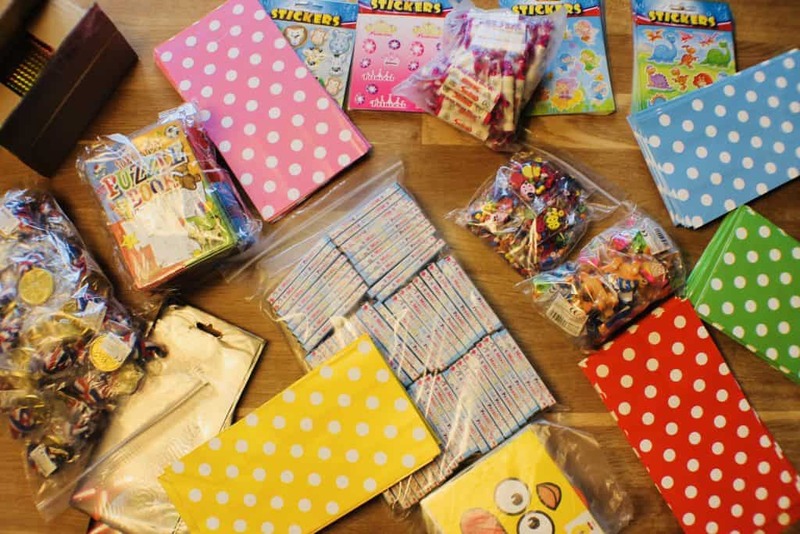 Line the contents up with the tallest and widest items into the party bag first and smaller items towards the end and then fill one party bag at a time. 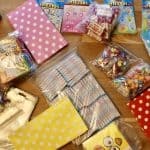 This saves you forgetting what you have added to each party bag and allows you to put completed party bags away before starting the next. A cup of tea or glass of wine can also be of help! Always put an RSVP date on an invitation, this stops you offending some parents as the party draws near and they are still too busy to respond to you. For a “full” look to a party bag a mix of heights, widths and weights will look far more interesting than a few small items hiding at the bottom of a party bag under a piece of cake. Try 4 to 6 items including a mix of large and small items to find will provide a little entertainment. You can use party bags to indicate that the party is drawing to a close. Distributing party bags is a polite indication that it is time to go home. Get your FREE printable party check list here! 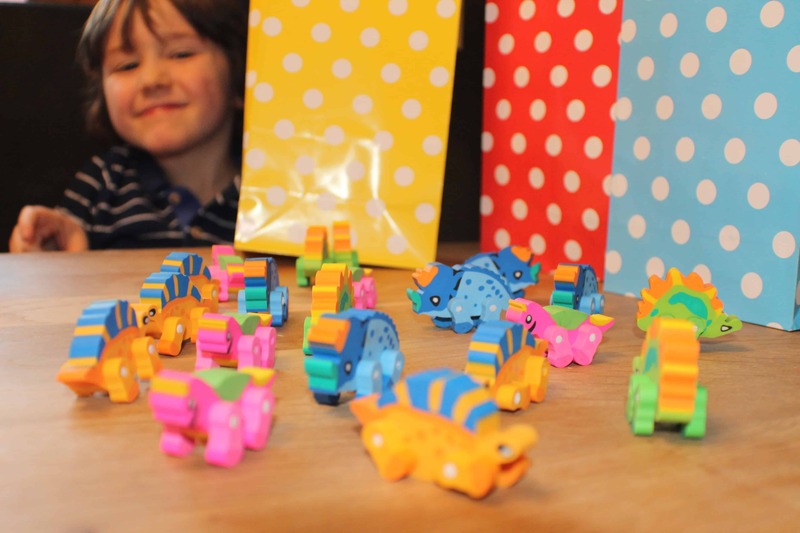 What are your top tips to make party bags a success? I would love to hear them. 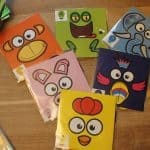 Please comment below with anything that you have done for your children’s parry bags that have gone down really well. Little Party Parcels supplied the party bags for the children’s party in exchange for a mention in my blog post about the party. All opinions expressed are my own. For more information, please see the disclosure policy. That’s so good that you can choose the exact amount of fillers. We always end up with random erasers, bubbles etc because of fixed size packs in the shops! Such a great service. Lovely that you can choose your own components. Must of the ones I’ve seen before have had set contents! It really is quite unique! Apparently it is exactly why Jennifer started the business, because she was so fed up of being forced to buy certain quantities of things that she didn’t need. I love this idea so much. It’s fantastic being able to buy items in the quantity you want. We have a birthday in April so I’m going to have a look to see what I can get for then! Fantastic service that you can drop whatever quantity you want into the delivery. Great idea !!! We also have 3 with birthday dates within a month of each other. We’ve done quite a few home based parties (I think about 30) and I wrote a blog piece last week on the do’s & don’ts of home parties. As Im a worrier top of my do’s is do lock up all pets – top of my don’ts is dont mix different unconnected groups of children. It’s really hard when the birthdays are close together, isn’t it? 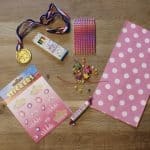 Planning my daughter’s joint birthday party – thank you!